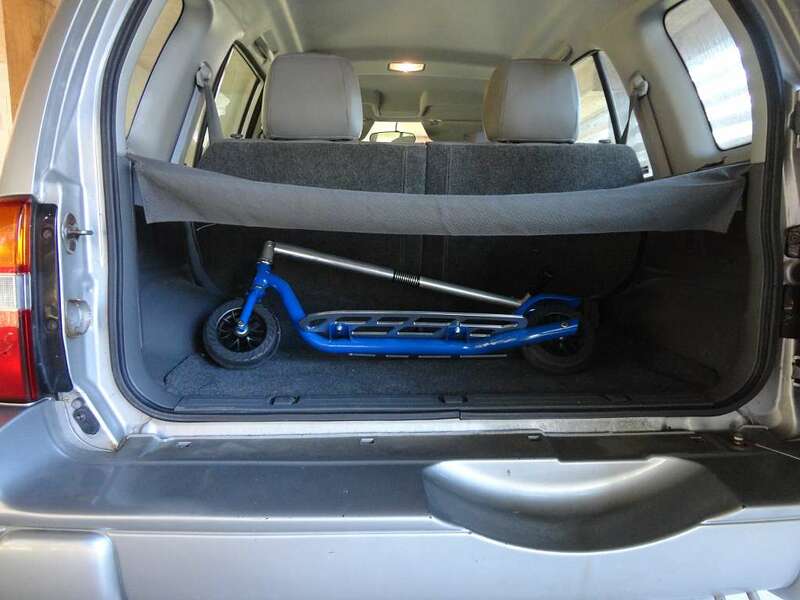 What we have here is a 40 lbs electric scooter with a 10-15 mile range that neatly folds to fit in the back of a MINI. People – and consumers, MINI hopes – do love scooters. Here’s a concept electric designed to fit in the trunk of a BMW MINI. At 40 pounds, when the juice runs out (not if), it should be pretty easy to kick. MINI is a transportation company. They solve transportation problems in smart and stylish ways that hold true to the MINI brand. And in this case that doesn’t necessarily mean an automotive solution. Today MINI takes the wraps off of the MINI Citysurfer, a product designed to solve transportation needs of urban dwellers in the most space and fuel efficient way possible while holding true to the kind of fun we expect with MINI products. And then there’s the Scooter-SportPed … more about that here. That’s “lojack” generically, with a small “l,” as in “zipper” or “velcro” … or “kickbike“; it’s not really a Lojack, but it will track your stolen bike. Footbikes are not easy to lock due to a lack of closed loops on the frame – if guard dogs aren’t available, you might want to take a cue from a security technology often used on said dogs – GPS microchips. In this case, camouflaged in a slick water-bottle holder, above. Designed by a couple of guys who cycle to work regularly, fly often and exercise daily, the Wingman bag will keep your dress clothes pristine on your back. Similar in concept to the Suitpack, the Henty Wingman rolls your dress clothes into a satchel instead of folding them. The Wingman (patent pending) was designed to transport business suits, dresses, shirts, ipads and accessories with the convenience of a satchel on your back. The suit bag has semi-rigid vertical ribs which restricts the diameter when rolled, minimising garment creases. This is what differentiates the Wingman from its poorer cousins – traditional fold in half suit bags. It also comes with a gym / utility bag and can be used with the suit bag or separately. Rolling clothes is good in general. Ask the army. The High Mobility Multipurpose Wheeled Vehicle (HMMWV), commonly known as the Humvee, is a four-wheel drive military automobile produced by AM General^. Similarly, the Kaz-USA Scooter is a single-foot drive civilian footbike that’s also ready to go most anywhere. They’re hand-made in California – huge, unique and the toughest push scooters around. Need to kick on the beach? 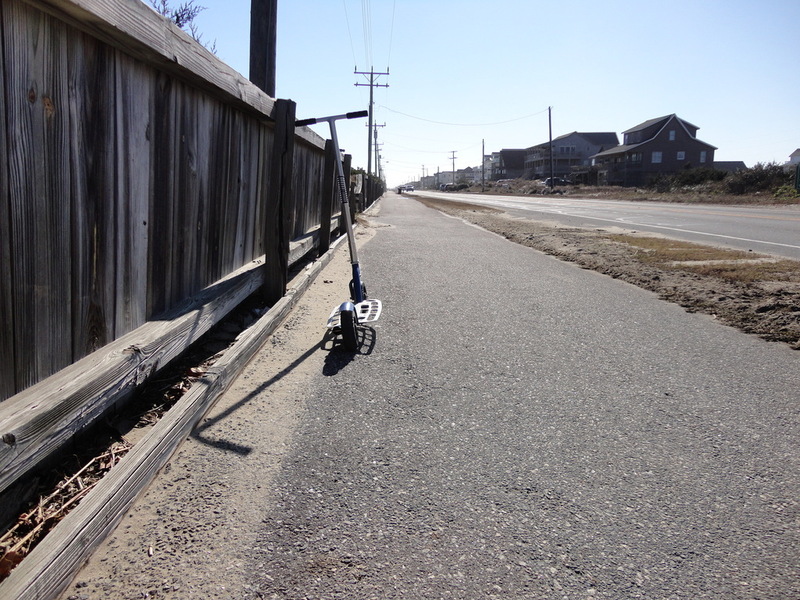 You can do it on a stepcross, but only right where the loose sand meets the ocean; there’s about a foot-wide strip of packed wet sand there that’s navigable by even a “street” footbike. But if you want to blast through the dune out onto the beach and back and forth, a Kaz might be just the thing. They make heavy-duty, really fat-tired scooters from all-terrain dog-scooters to “duallies” like those trucks with four rear drive-wheels, not to mention utility scooters that actually have a wagon attached, complete with a front disc-brake for when you’re carrying bricks down a hill. They’re available at a Yahoo! store and some from Amazon. (I’m surrounded by sand on a barrier island. Hmmm.) Hat tip to Trottinette Magazine. Today I had to take my car to the garage for a checkup and leave it, about 4-5 miles from my house, so I flung the SportPed in the back of it and set out. Coming home on the scooter I got a good idea of how the ‘Ped actually performs when some distance needs to be covered. The scooter manifesto, or why scoot? Relaxation for the whole family. On a scooter I’m an opportunistic rider. I use both road and footpath depending on the typography, surface and traffic conditions. When riding on footpaths I’m often jumping on and off the scooter to negotiate around people and over bumps, gutters and tree roots at a speed just above jogging pace. Never fear! Scooter-nurse is nearly here! 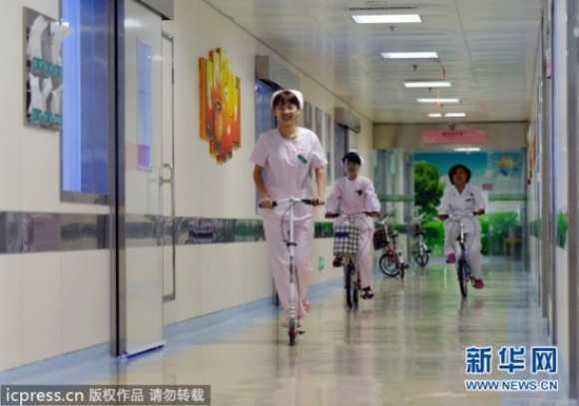 Testing proved the wisdom of the concept as nurses employing a kick scooter or bicycle were able to cut their average response times by 7 seconds – no small potatoes in cases where every second counts! Just look both ways before you leave your room on the corridor!